Medical Officer vacancies available in this OPSC recruitment. Candidates submit their application form online from 10-01-2019 to 31-01-2019 through official website of PSC of Odisha @www.opsconline.gov.in. Selection for this Medical Officers recruitment will be held through written test and career marking. Check below given information of OPSC MO Assistant Surgeon Recruitment 2018 vacancies, exam pattern and more details are given below. MBBS Degree qualification is required from a recognized university or institute which is approved by Odisha Medical Council or Medical Council of India. Candidate must have completed internship program and mush have registered with MCI or Odisha Medical Council. The candidate's age limits as on 01-January-2019 is 21-32 Years for reserved candidates age relaxations re applicable as per government norms of Odisha State. Selection for this OPSC Assistant Surgeon recruitment will be held based on 2 different stages. Written Examination will be conducted for 200 marks with 180 minutes duration this is completely objective type exam consists of multiple choice questions. There is no negative mark for each wrong answer. Written exam duration is 3 hours. Subject and Marks details for written exam is given below. For SEBC, General candidates application fee is Rs.300/- and there is no fee for SC, ST and PWD candidates. Candidate can apply online @opsconline.gov.in on or before the closing date of 31-01-2019 and pay the application fee as per the given instructions at the time of application submission online. 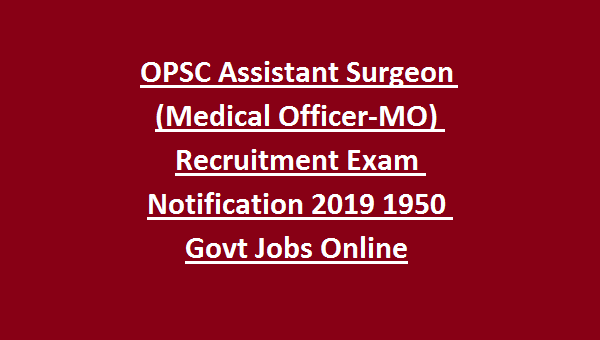 Click here to see the official notice of ODISHA PSC Assistant Surgeon Recruitment 2019. 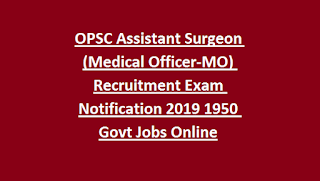 Click here to apply online for the ODISHA PSC Assistant Surgeon Recruitment 2019. Please share this ODISHA PSC Assistant Surgeon Recruitment Examination 2019 article with your friends.
. After successful submission of application form take a printout and send it to the below given address along with Attested copies of registration, educational qualifications, community certificate, age proof and if any other related documents. Each document to be signed by Gazette Officer or Notary and on every copy candidate have to sign on mentioning "submitted by me". On Cover letter mention the "APPLICATION FOR THE POST OF MEDICAL OFFICER (ASSISTANT SURGEON)"
"The Special Secretary, Odisha Public Service Commission, 19. Dr. PK Parila Road, Cuttack 753001"